After Hiroshima was the Shimanami Expressway (‘Kaido’ in Japanese literally meaning sea road) and Onomichi. 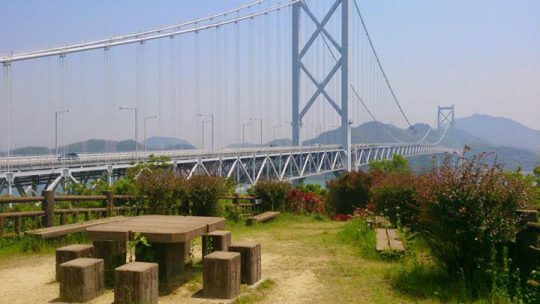 The Shimanami Expressway is a 70km long road that ties the city of Imabari, Ehime in Shikoku with Onomichi, Hiroshima on the main island; and is also where the first cycling road (‘Setonaikai Oudan Jitensha-do’ = Seto Inland Sea crossing bicycle path) in Japan is to cross over an ocean strait. Onomichi is a small port town on the Seto Inland Sea in the east end of the prefecture of Hiroshima, located midway between the cities of Hiroshima and Okayama. There are a lot of ups and downs in the area, and the view from the higher grounds are awesome <3 It's a beautiful place full of character and is often used as the setting for movies. そして極めつけは尾道風お好み焼き。広島焼きと基本的には一緒の様ですが、豚肉などの変わりに砂肝が入るのが特徴です。 To top it all off, there was the Onomichi okonomiyaki. It was basically the same as the Hiroshima okohomiyaki, only instead of pork meat, it included gizzard. これがすごーーく美味しい！！これはクセになる味です。 ぜひ皆さんも尾道に行ったらコレ！ご賞味下さい☆ This gizzard was soooo good!! It's really grows on you. To you reading this, please be sure to give it a try when you're in Onomichi!